Test version of UserPatch v1.4 on Voobly. This remains subject to change, and compatibility is not guaranteed with the final release. All available video resolutions, including widescreen, are selectable. Performance improved significantly for single player and the rec viewer. Multiplayer CPU processing overhead reduced for human-only games. 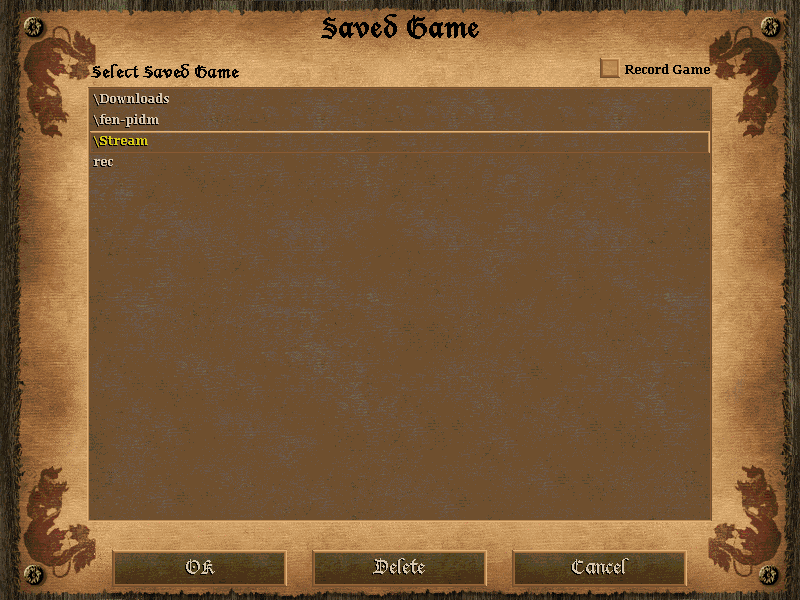 Double-click .mgz and .mgx recs in the SaveGame folder to open them directly. 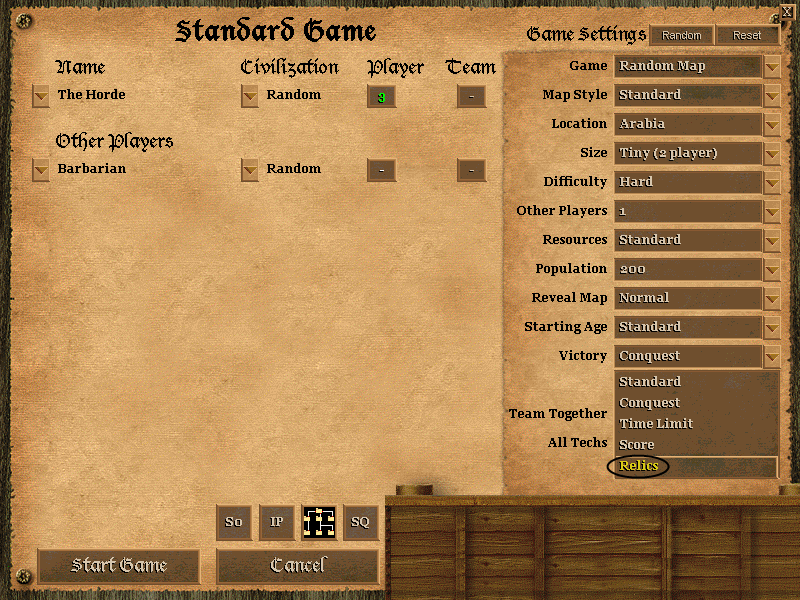 Team Random will mirror itself, preselected civs, Random, and Full Random. The interface now updates at 60fps for HP counters, progress bars, and more. 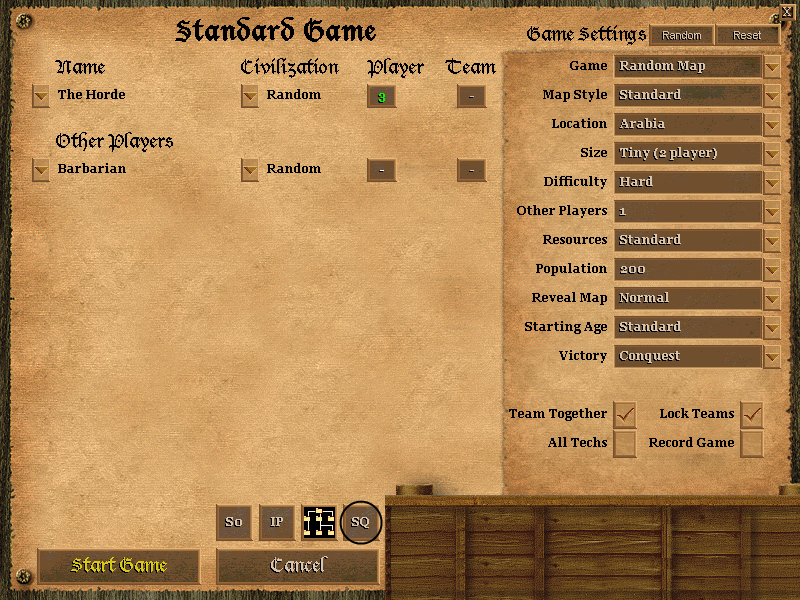 Optional hidden civilization selection for lobby launched multiplayer games. Double-clicking on hero units will not select similar looking hero unit types. Barracks and castle huskarls are still selected together with a double-click. Set the Patrol Default state to On (10s delay) or Off (2s delay) with "Ctrl+F1". Hold "Ctrl" when clicking the patrol destination point to use the other delay. Always-on-top and Background modes now display onscreen notifications. Hover help can be toggled independently from event notifications with "F1". Background mode is now tri-state: on, off, view lock. Hosts can control this with the spectator button at the bottom of the setup screen. Watch single player games, campaigns, and even 4v4 multiplayer games. Enable restricted viewing or allow up to 32 people to spectate at once. Spectators can late-join a game for about 10 minutes in game time. If "Record Game" is off, your game is recorded to "rec.mgz" and overwritten each new game. If "Record Game" is on, your rec file is uniquely dated: rec.yyyymmdd-hhmmss.mgz. Never miss an epic event in single player if you chose not to enable unique recording. For multiplayer games, if "Record Game" is off, it is completely disabled, as usual. The rate hotkeys (usually numpad+ and numpad-) switch players without dropdown box lag. The flare button/hotkey (usually Alt+F) will toggle the fog of war setting. Replay speed now spans from 0% to 100% (0% = original slow, 100% = fast/unbounded). The Slow button reduces speed by 25%, while the Fast button increases it by 25%. Hold the "Shift" key when clicking these buttons for finer adjustments. The Normal button will return playback to 50% speed (75% when spectating). Trigger elements are named and prefixed: C (condition), R (reverse condition), or E (effect). Fixed trigger corruption when attempting to select more than 25 units for a patrol effect. The Set Objects button will perform changes more reliably, avoiding unintentional deselection. Objects in the "Others" category will not be reset when returning to a trigger. Hosts can control this with the SQ/MQ button at the bottom of the setup screen. Select SQ for v1.0c style single queuing or MQ for the new multiple queuing. 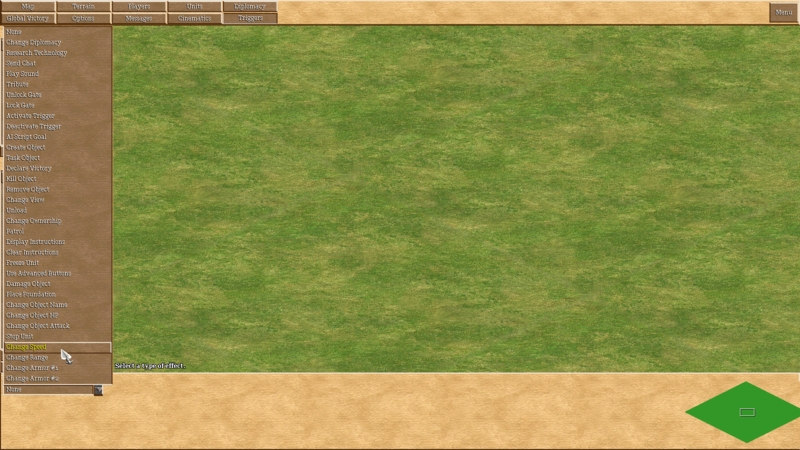 With MQ, if multiple buildings are selected, any units trained will be auto-distributed. Changing this in single player mode will preserve the default for future games. Team Random: mirrors civs on other teams, randomizing only if necessary. 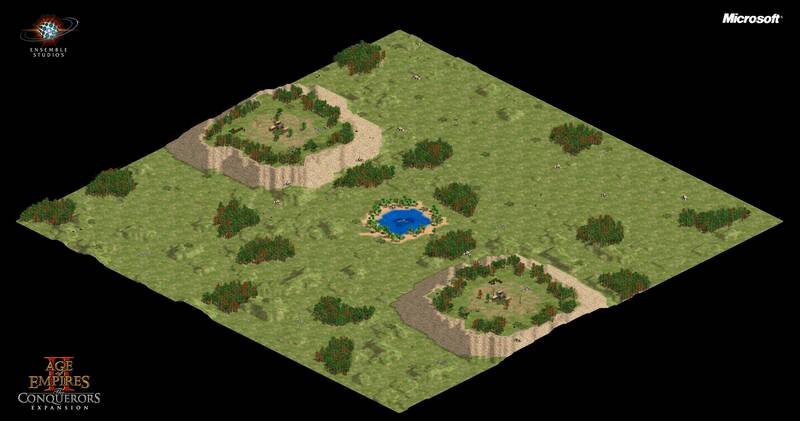 Random: the original Random, which attempts to give you a unique, random civ. Full Random: truly random, giving you the first pick, without regard for uniqueness. Patrol Default: Off - units initiate attacks after 2 seconds when patrolled. Patrol Default: On - units initiate attacks after 10 seconds (v1.0c style). Extended Help: Off/Off - all of the extended help is disabled. Extended Help: Off/On - event notification messages are displayed. Extended Help: On/Off - extended hover help popups are displayed. Extended Help: On/On - both event notifications and hover popups are displayed. 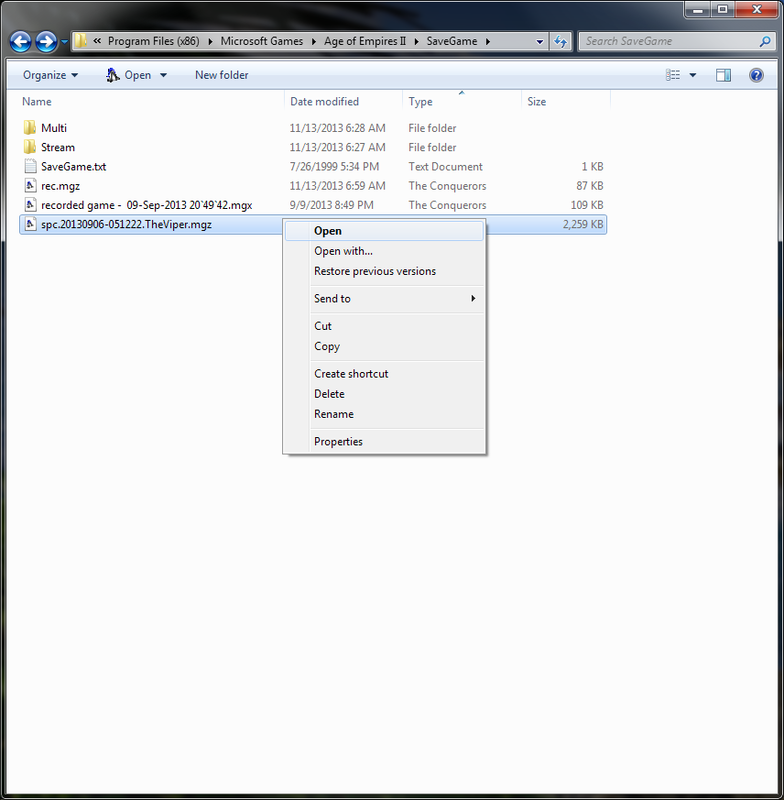 Set View: Off - window will move behind other windows (default). Set View: On - window will stay on top of other windows. Back: Off - mouse locked inside window border, pause on alt+tab (default). Back: On - mouse free to move beyond border, no pause (spectator default). Back: View Lock - mouse locked inside window border, no pause (new). Set your favorite tracks as background music during gameplay. 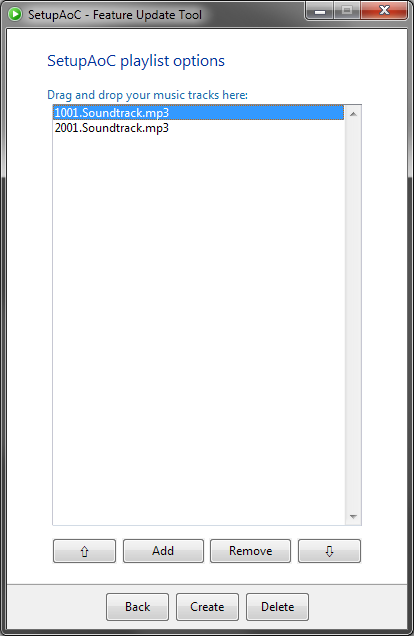 Create a "music.m3u" playlist in the "Sound" folder of the game. Press "F6" to skip to the next track during gameplay. Please see the Music section of this guide for more information. 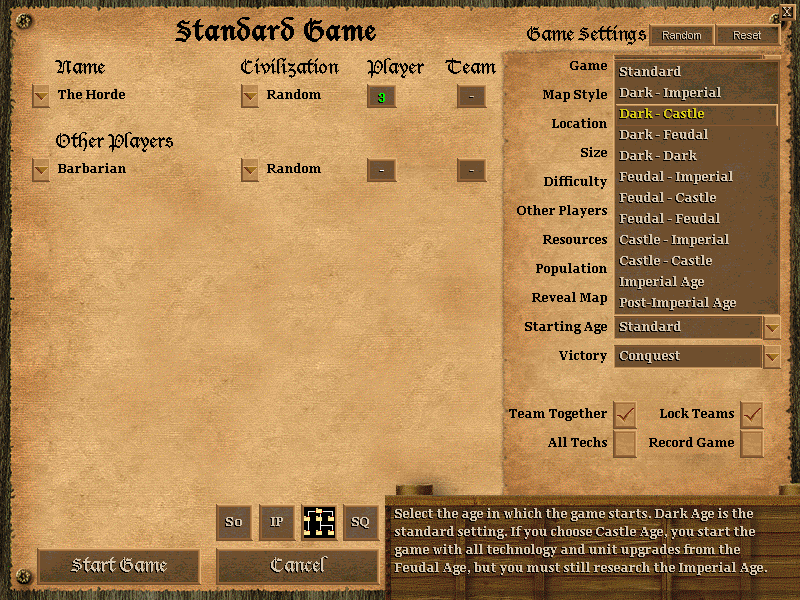 The "Standard" and "Dark - Imperial" settings span all ages of the game. All of the other settings are restricted as described from starting age to end. 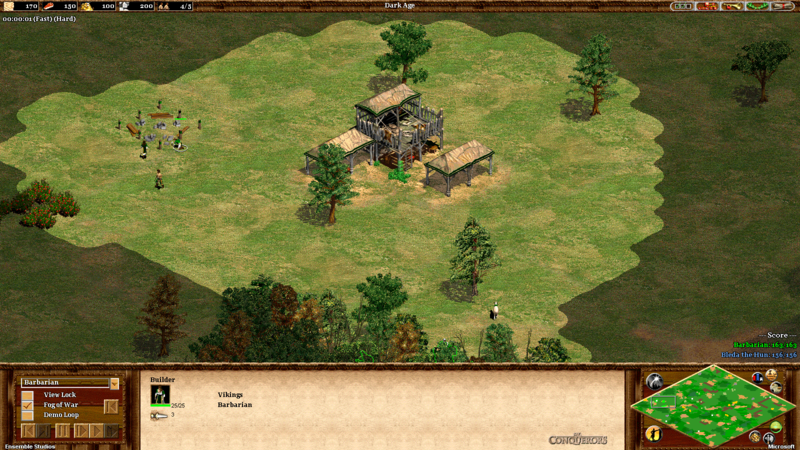 If you play against the built-in Computer, a Castle Age maximum or later is required. Wonder Race must reach the Imperial Age, unless your mod allows early wonders. This optional condition can be found with Standard, Conquest, Time Limit, and Score. In this mode, the first player/team to capture all relics wins the game. There is no countdown; once all relics are captured, the game ends immediately. This condition is almost identical to the scenario editor-exclusive condition. New maps can use team positioning for a different experience. 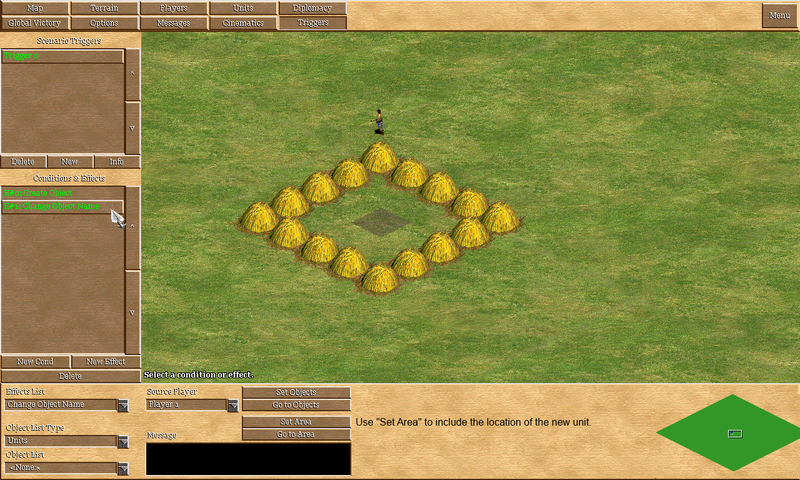 Start your civilization on maps with new elevation attributes. AIs are selectable in multiplayer (direct ip or lan games are most stable). Multiplayer games can be started with only AI players for practice. AIs can now choose to close openings created in their walls. Boar hunting and luring is now fixed and operational for AIs. Ungrouped AI players will not ally themselves against humans. AIs are now able to lure deer and clear trees on michi maps. The [You must login to view link] describes all of the new features. For required defconsts, please see the included "UserPatchConst.per". Please visit the [You must login to view link] for more information. 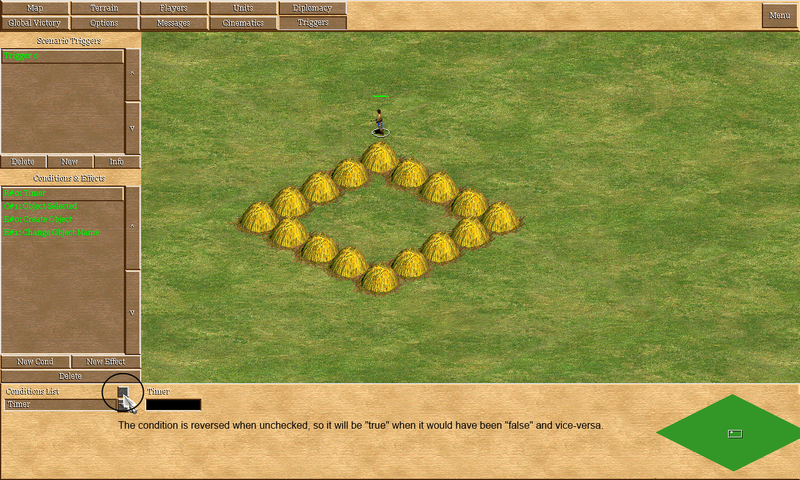 Press "Ctrl+S" once to disable grid placement of non-building objects. Enable free placement of all objects by pressing "Ctrl+S" a second time. Fill new maps or modify existing maps with any available terrain. Create maps using custom rms scripts directly in the scenario editor. Trees, mines, and more are now properly replicated by the map copy feature. Change the names of units in a specific area, without having to preselect. Use negative numbers more freely with trigger conditions and effects. New reverse condition checkbox to invert your scenario trigger conditions. Area selection options for the patrol effect and the fewer-objects condition. Change object speed, range, and armor with new trigger effects. Some features of v1.4 may be unavailable.